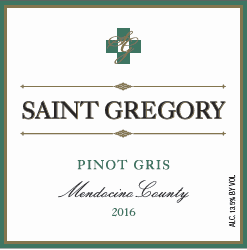 Pinot Gris has quickly become one of the most popular white grape varieties in the world. This rust-gray tinted skinned grape, enjoyed for centuries, is said to be a mutation of the Pinot Noir grape. However, it seems unsure whether it is a red or white wine grape, hence, grigio, meaning gray. Monte Volpe is the oldest producer of Pinot Grigio in California. This blend has produced a rich, floral wine with aromas of tropical fruits, cantaloupe melon, and multi-colored Jonathan apple with a hint of wet stone. A lively mouthful of spicy apple and stony minerality is balanced by crisp acidity throughout the finish. Excellent as an apperitivo or serve with seared scallops with Beurre blanc sauce, grilled swordfish or chicken picata.